Jon David loves the water. His bath, the dog bowl, my glass with ice, his cup and anything else with water- LOVES IT!!! I'm ready to get him in the pool. I've bought swim suit trunks and tops, hats, swim diapers and sunscreen. 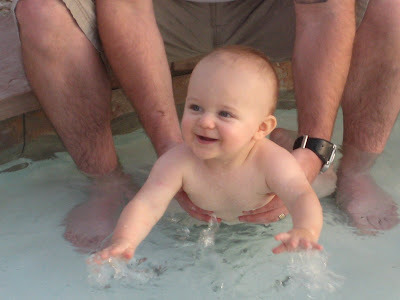 He ended up in the pool at his Godparent's house Saturday evening in just his diaper. 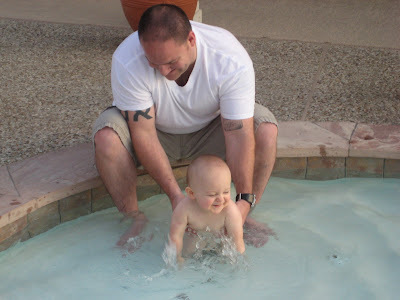 We were outside checking out their new palm trees when he started reaching for the pool. I bent over and let him stick his hands in. Of course, this was not enough! We stripped him down to his diaper and let him splash. He was mad when we took him out, but I was afraid he was cold. I'm glad I bought myself a new bathing suit because it looks like we'll be spending alot of time in the pool! He is so beautiful, Oma Dorie said he took 3 steps, watch out Mom and Dad, the fun is just beginning...he will find things you didnt know you even had!